This week we are reaching smack dab into the mainstream to bring you Cool Comics featuring superheroes who have been around for a combined 145 years. 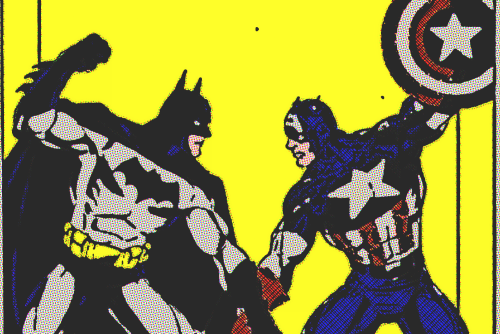 There are interesting new takes on both Batman and Captain America. Both harken back to the 1960s, but in totally different ways. First, we’ll take a look at the Caped Crusader. Burdened with the cumbersome title, “The All New Batman The Brave And The Bold,” we find one of the most entertaining Batman comic books on the stands. Based on the excellent (and sadly out-of-production) Cartoon Network series, “Batman The Brave And The Bold,” this comic captures the spirit of fun that made the 1960s Batman TV show so memorable. 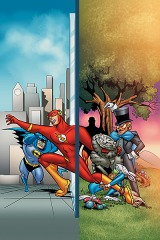 This is a fun, kid-friendly, Batman, teaming with his super friends to fight crime. You won’t find any deep psychodrama, violent murder or sexual overtones here. The cartoon is a return to the idea of fun superheroes, and the comic book is a perfect companion piece. The title and concept are a bit of a throwback, too. In the 1960s and 1970s, DC Comics published a title called “The Brave And The Bold” which featured Batman teamed up with a different superhero every issue. This was a fun concept for a simpler time, since back in those days comic books contained stories that usually wrapped up in one issue, rather than sprawl out over the course of a year’s worth of comics like they do today. The late Bob Haney, an under-appreciated talent, crafted great stories that managed to throw The Caped Crusader into strange situations that required him to team up with characters with whom he wouldn’t normally interact. Sometimes it was a straightforward team up with Green Arrow or The Flash. Occasionally he’d put Batman in action with obscure characters who didn’t really fit into the regular DC universe at the time, like Wildcat, Plastic Man or Kamandi. But Haney always managed to do it and tell a great story at the same time. The excellent artwork, usually by the late Jim Aparo, didn’t hurt any. When it was decided to take the animated adventures of Batman in a new direction, following the rather dark series, “The Batman,” the producers chose to return to the team-up concept and a Batman (voiced by Dedreich Bader) who was more in line with Adam West’s portrayal of the character than Christian Bale’s. 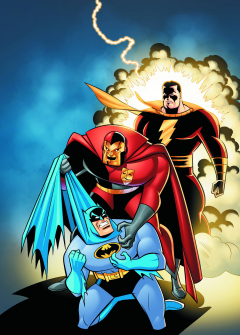 The result was a great cartoon series that saw Batman teamed with fresh renditions of Green Arrow, Aquaman, Captain Marvel,Plastic Man, and in a musical episode, Black Canary. The series was fun for kids and managed to strike a nostalgic chord with their parents without coming across as too cheesy. Another feature of the cartoon was that it included tons of references to pre-Crisis DC Comics continuity, making it manna from Heaven for comic book geeks like myself. DC Comics previously published a terrific comic book version of this series, but recently canceled it and then started over again with a new first issue. That’s why the title of the comic is so long, but it’s still a great comic that can appeal to kids and adults. Apparently they felt that more folks would buy it if they started the numbering over. Let’s hope they’re right. Written by Sholly Fisch, with art by Rick Burchett and Dan Davis, “The All New Batman The Brave And The Bold” is just sheer fun. 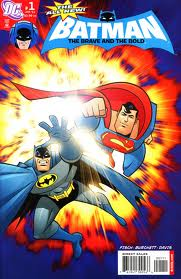 The first issue teamed up Batman with his old chum, Superman. The second issue saw him in action with Captain Marvel (Shazam, to non-comic-geeks), while the third issue saw Batman and The Flash stuck in an “Alice Through The Looking Glass” trap, thanks to Mirror Master and The Mad Hatter. This is not the grim and gritty ultra-realistic Batman. This is a Batman who seems fully aware that you can’t really strike fear into the hearts of criminals when you run around with your underwear on the outside of your pants. As with the cartoon, the comic book is chock full of obscure references to the fun days of comics, before reality intruded and made everything dark and nasty. 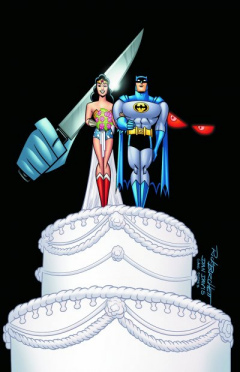 This is a Batman comic book that you can read with a smile on your face. 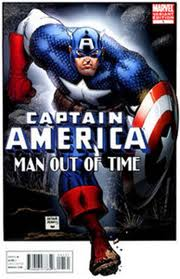 “Captain America: Man Out Of Time” is long overdue. This is sort of a “What If” story, and sort of an updating of one of the more fascinating parts of the story of The Patriotic Super Soldier. If you’re familiar with comic book history, then you know that Captain America was created by Joe Simon and Jack Kirby right before World War Two. After the war, Marvel Comics (then known as Timely Comics) phased out their superhero books and focused on other genres, such as crime, horror, Westerns and humor. A brief revival of their three main superheroes, Captain America, The Sub-Mariner and The Human Torch was tried in the 1950s, but fizzled after a brief period. Flash forward to the early 1960s, and Marvel was once again finding success, this time with a new wave of superheroes like Spider-man, The Fantastic Four and The Avengers. Marvel’s editor-in-chief had revived The Sub-Mariner in the pages of The Fantastic Four, and decided to try to bring back another Golden Age great in The Avengers. He did this in a novel way–he had The Avengers find Captain America in a chunk of ice, where he’d been frozen since the waning days of WWII (the 1950s revival was ignored at this time, but years later they explained it away). Not only did you have America’s great super-soldier, the walking embodiment of the spirit of Old Glory, but now you had a man who’d spent nearly twenty years on ice…literally. In addition to his super exploits, Lee was able to tell the fish-out-of-water tale of a man who’d missed a couple of decades of life and culture. America may have been a fish-out-of-water in the 1960s, but he’s had nearly fifty years to adjust, on top of being killed and brought back to life. That’s why this new series is notable. In this series, Captain America comes back TODAY. He’s been frozen in ice for over sixty-five years. The culture shock is magnified a hundredfold. 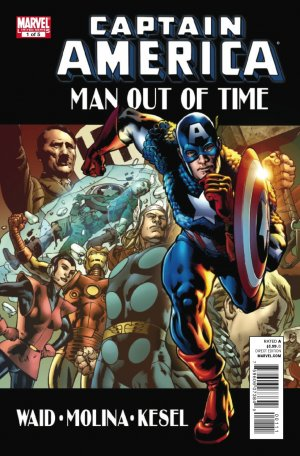 Also notable is that “Captain America: Man Out Of Time” is written by one of the best superhero writers in the business, Mark Waid (Kingdom Come, Irredeemable, The Flash). Waid, who has written Captain America before, brings a fresh approach to this series and has a great handle on Steve Rogers disorientation and confusion (he believes he’s hallucinating). The artwork by Jorge Molina and Karl Kesel is state-of-the-art sleek superhero work with masterful layouts and great finished art. The colors by Frank D’Amarta are striking as well. There’s some great stuff in this series. Freed from the last fifty years or so of continuity, Waid brings us a Captain America who has to figure out how to use the internet, then becomes distraught when he uses it to find out when President Roosevelt died. We also get to see the good Captain interact with modern-day versions of Tony Stark (Iron Man) and Reed Richards (Mr. Fantastic). 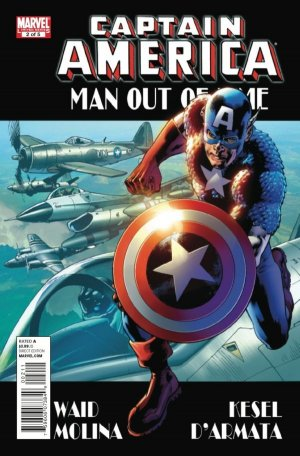 This is a gripping superhero story, one that completely blows away all that nonsense over the last couple of years that saw Captain America killed, then revived, then retired. There’s a movie version of Captain America coming to theaters later this year. If they know what they’re doing, the story will be close to this comic book series. Both of today’s comics are ongoing, and have yet to be collected. You can probably track them down through Lost Legion Comics and Games on The West Side. I’ll let you know when the collections are available.